On Friday 18th January I’ve pushed another update for the book. This time I rewrote the whole chapter about std::filesystem. Please have a look at what changed and what are the plans. The book got more than 25 new pages! The book had a filesystem chapter from the start, but it was concise and didn’t contain much information. From the beginning, the plan was to rewrite it, similarly as with the parallel algorithms chapter. That’s why I released a new chapter - CSV reader - before this one. By working on a real project, I could learn more and experiment. I needed that to be able to deliver better content. Here’s an example, where you can pass a path and then use regex filter and match the file names. The code iterates over a directory with recursive_directory_iterator and then filters out only regular files. Later, the function transforms that vector of paths into a vector of FileEntry objects. When all files are collected the main() function uses std::regex to do the matching. As a possible optimisation, we can also create a vector of directory_entries rather than paths. This would allow us to fetch the files size faster, as direcotry_entry::file_size is usually cached and filesystem::file_size needs another file access. 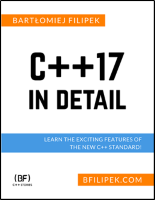 I’m happy to announce that thanks to the collaboration with the team @Educative we published C++17 in Detail as an interactive course! 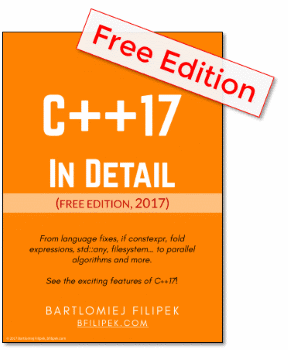 It consists of 200 lessons, many quizzes, code snippets… and what’s best is that it has more than 120 playgrounds! That means you can compile and edit code sample directly in the browser… so there’s no need for you to switch back and forth to some compiler/IDE. I think that such approach increases your learning experience. Use this coupon to buy the course at a much lower price! Special thanks to JFT, Jacek Galowicz, Michał Czaja, and other reviewers who contributed to the chapter! So far the book was mentioned in several places. The book is 99% ready! The remaining parts are related mostly to book polishing and smaller fixes! For example this week I plan to release a small update for the std::filesystem chapter (adding notes about handling file permissions).